I grew up in Adelaide and my family still live there. I left for Sydney in 1995 and in 2006 moved to London. I keep resisting the calls from my family to move back to Australia, and one of my main defences is that where I’m playing (the UK and US) we are well advanced in terms of digital marketing and social media and that I’d be twiddling my thumbs for a couple of years if we moved back. 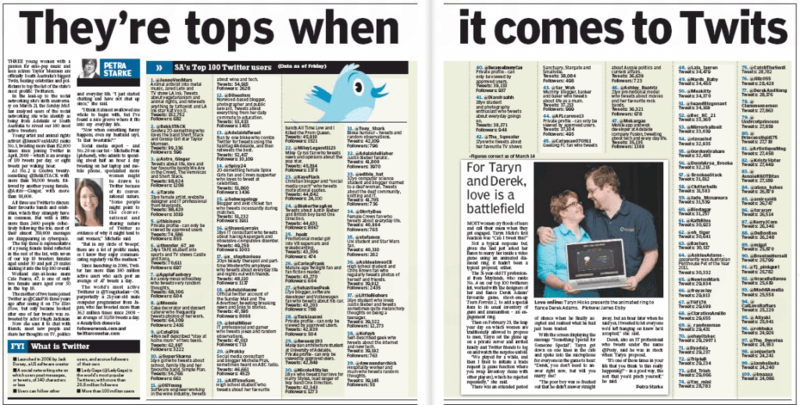 This is probably a bit harsh, and it keeps my family at bay however my eyebrows were raised when I was reading the Sunday Mail (Sunday version of the Advertiser, Adelaide’s only newspaper) on my iPad and came across a story about “SA’s top 100 twitter users”. This piece helps fuel my belief that some organisations are stuck in 2009 when it comes to social media. 2012 – who is the most influential and generous in my community in my city? 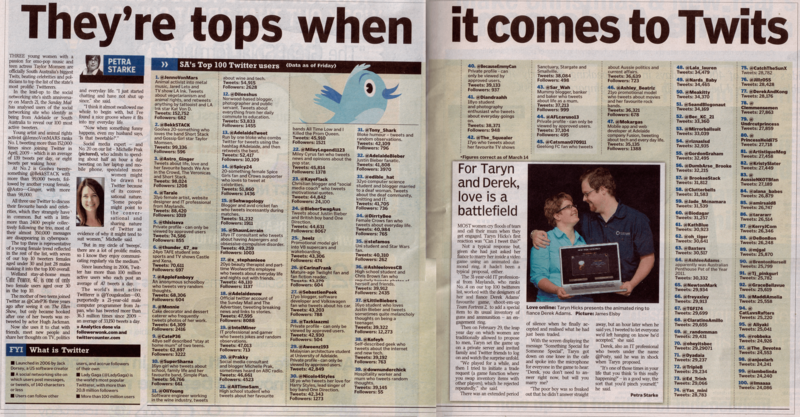 The Sunday Mail piece awards the “top tweeter” status based on the “number of tweets“?? …all pretty scientific – and they apparently used a couple of free tools to come up with these gems! If only Michelle Prak @prakky (#20 on the list, Kred score of 828/9 top communities recruitment/sailing/advertising) had consulted them this would never have happened. The Sunday Mail article shows where social media is in some parts of the world and what qualifies as “mainstream” journalism. I’m still shaking my head about this. If this is where Adelaide is at in terms of social media understanding, then I’m staying put. Update – just found out that the author of this piece is Petra Starke @petstarr ( Kred score 763/7 communities reporters/celebrity news/news) and she actually lives in New York – and writes about Adelaide. She should therefore know better from a New York perspective that no-one talks in terms of “top tweeters” based on the number of tweets from a protected account. PS – After posting this, I received a cryptic tweet from Petra..
@AndrewGrill @prakky I could tell you that I wrote the article I was asked to write, but instead I’ll just tell you to write a letter to Ed. PPS – if I “write a letter to the Editor” and respond in the way that old-school newspapers want me to, then no-one would have heard about it. Instead, I tweeted you, and you responded instantly and already hundreds of people (500 at last count) have clicked on the link I shared on Twitter and are ready my response to the editor. This is the new world (and the new world for brands also). For a very reasoned view on this whole issue – head over to Michelle Prak’s blog and read what she thinks. What a pity a double page spread was wasted on a list, instead of more insightful piece to help Twitter’s non-users understand the full potential of the medium. A more apt title for the article like “Adelaide’s most prolific tweeters” would have helped. Hopefully the Sunday Mail will follow this up with social media stories that don’t treat their readers and Twitter users like idiots. I’d love to arrange a @kred powered “Top SA Influencer” list – ranked properly by influence and outreach – that would be a much more interesting list to read. Mark – you’re so right. Looks like this article was commissioned to appeal to a Sunday audience about “what is twitter” – and even after reading it I’m still not sure what they achieved. Also consider the fact that I know of 2 Adelaide tweeters who were left off the list for no apparent reason, despite “qualifying” by having over 25,000 tweets, leads me to assume that Petra Stark really put very little thought into it. Not that I expected anything else from the Sunday Mail. Adam, where I come from (that would be the real world) no-one but no-one values the worth of a twitter user by the number of tweets. This is not a metric any brand, expert, guru or normal person uses. It’s all about who’s relevant. Even the number of followers would be a basic, yet more meaningful measure – but followers?? Just because you tweet a lot means… well it means you have a lot of time on your hands and brands steer clear of you. They want to find real influencers that have disposable income and don’t spend all day tweeting. I have been on twitter since May 2007 and have sent “only” 18,000 tweets (around 10 per day) and that’s a lot for someone gainfully employed. Hi Andrew and readers, good to see my Twitter story has sparked some discussion. I’m not going to address comments on whether the piece was good or bad – you’re allowed to have your own opinions about what was published. Suffice to say we chose a metric to measure, that metric was tweet volume, and the story made it clear that’s what the “top 100” referred to. It was a totally objective list based on numbers alone, and was not intended to reflect “quality” or “influence” of Twitter users. I would like to address a few points though, firstly – my name is Petra Starke, not Stark. It’s pretty clearly printed on my article. Secondly – I’m not sure what a “New York” perspective is, or how it should affect anything I write about Adelaide. Sounds patronising to me. Thirdly, to commenter Adam – as there is no exact way of pinpointing Twitter users’ location without them deliberately geotagging all their tweets, the list was restricted to people who used the keywords “Adelaide” or “South Australia” or “Radelaide” or “SA” or “ADL” in their profile description to describe their location. This was made clear in the article. If your friends were left out, perhaps that’s why? Fourthly – to address Andrew’s comments about the top 3 having locked profiles or listing strange place names as their location: these changes were made after the article was published, I assume because despite being contacted well in advance of publication, they were a little freaked out by the attention. Both the top 2 denied requests for interviews. My article set out to do nothing more than what it claimed – which is to list South Australia’s 100 most prolific Twitterers. Anything else – deducing “influence” for example, which is hardly a perfect science – would have made the list subjective and probably caused even more of a stir than it already has. Petra – fixed the typo on your name. Apologies for that. The NY vs SA thing -> the whole point of my post was that the UK and US are more advanced than say Australia. As you will see in my comment above, nobody uses tweets as a metric for anything. For all we know you were counting Adelaide based twitter bots spamming people. Of greatest amusement was your tweet that suggested I complain to the editor by a letter. If I “write a letter to the Editor” and respond in the way that old-school newspapers want me to, then no-one would have heard about my issue with the article. Glad the article has prompted some discussion! “If I ‘write a letter to the Editor’ … then no-one would have heard about my issue with the article” – sure, only the 599,000 people who read the Sunday Mail every week. But for instant gratification, granted, you can’t beat Twitter. Petra, this is making you look silly. 1. Get the Editor to approve my letter (small chance) – if that does not happen then point 2 is mute. In 2012, I’ll stick to Twitter, it’s real-time, invites conversation and is the future of communication. I find this a little condescending. I can assure you that many Adelaideans do get social media, and are as up to date as the rest of the world. It’s not our fault that the rather limited print media in this country hasn’t cottoned on yet. Just a small comment about numbers of followers. There’s still a lot of people out there who love to have this massive number of followers beside their names, but on investigation many are bots, eggs and almost any other sort of flotsam that could attach itself to them. I could have easily had something like 7000+ followers had I not done some weeding and left myself with actual people. Weeding doesn’t take long, and I block about five people per day, and might leave one. I have about 1500 actual, living, talky, friendly followers, and what’s more, it looks better to those who might want to follow me in future.